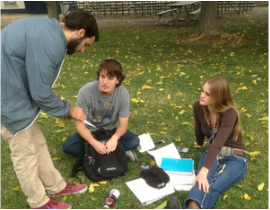 Clipboard is a mobile form of campus witnessing. It uses the FARM conversation. This is the same as the FORM conversation with A (academics) substituted for O (occupation). It involves workers going to those who might not otherwise inquire at the table. Clipboard uses one simple tool: the Clipboard Survey. The first three parts of the survey are Engage; the last part is Inform and Invite. The following are tips we have found helpful for an effective experience. Clipboard wisely by interacting with students who have time to talk. Don’t be afraid to interact with students using electronic devices since many are just passing the time. They are often open to personal interaction. Clipboard socially by approaching students in groups. Clipboard is not just for individuals. Often, a group will take the survey. If more than one responds, record multiple answers on one sheet. Clipboard together by going in pairs, preferably, a guy and a girl. If a student indicates an interest in wanting to know more, the same-gender person can continue. The other-gender person can peel out while the same-gender person continues with the next step, Teach. Clipboard genuinely by taking your time. Ask follow-up questions. The goal is to discover whether a person is interested in knowing more. Have fun. Share common interests, but don’t dominate with stories about yourself. Clipboard intentionally by pairing up with another person, and planning a time each week. Committing to a specific time each week is one of the best ways to stay involved in witnessing. Clipboard discerningly by targeting age-appropriate freshmen and sophomores if on a community college campus. Thank those who don’t fit the profile of your group for taking the survey. Encourage them to find fellowship in a local church. Don’t own the responsibility of meeting the needs of those whose level of care exceeds the resources of your group. Clipboard honorably by practicing “catch and release” with those who do not want to know. ​Clipboard strategically. Move to the next step Teach (Establish) with those who want to know more.